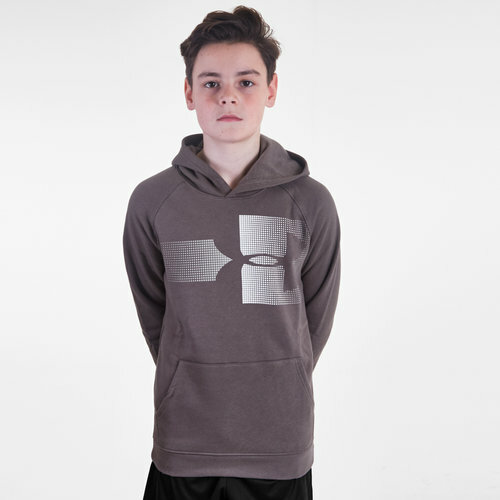 Keeping you warm and comfortable both in training and out of action, pull on this stylish Rival Logo Kids Hooded Sweat in Silt Brown and Onyx White from Under Armour. This hoodie has been designed for a loose, fuller cut for a more comfortable feel. Water-resistant, stretchy and warm, made from a cotton & polyester utilising Under Armour's Storm technology repels water without sacrificing breathability. A drawstring hood keeps your head warm and dry whilst the front kangaroo pocket does the same for nyour hands as well as storing valuables. In a classic brown design with the famous Under Armour logo upon the chest, you'll look as good as you feel in this Rival Logo Hooded Sweat.